recover lost deleted formatted psp from EXFAT/FAT32/NTFS hard drive system or external drive, usb drive. PSP file recovery - Aidfile format PSP recovery software is the professional format PSP recoverytool & utility. This format PSP recovery program (application) can give you a best solution to solve your problem about data lost after format PSP. Use "Undelete" mode to recover deleted files from PSP hard disk. Use "Unformat" mode to recover lost files after format PSP hard disk. Use "Recover partition" mode to recover files if PSP hard disk partitions changed or damaged or deleted. Use "Advance Scan" mode to recover lost files if PSP hard disk partitions show as "raw" or recover deleted files which can not be found with "undelete",recover files from raw partition,recover files of partitons which are not NTFS,nor exfat,nor fat32. 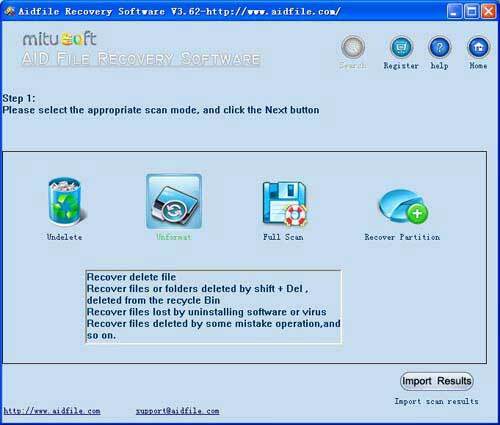 Aidfile data recovery software recovers lost PSP data, files, folders from formatted SD XD MMC memory card. Application program rescue accidentally erased pictures images songs videos from formatted cards,drive,disks etc.